I met Doug at the ground after respective family events and settled into the seats near the scoreboard, Northern Stand, Punt Road end. Expectations were quite different, as quizzing Doug, he had tipped the Cats, and I, The Pies. 13 mins in Cats 2.2 and should be further in front. Lots of basics errors and poor choices on the backline – kicking to 1 on 2 contests and generally not playing with the confidence of past weeks. Geelong have come to play. 23mins in we get a free and a 50metre penalty and our 1stgoal. 27mins and siren time, low scoring – Pies 1.3 – 9, Cats 2.4 – 16. The Cats should have been further in front having won most of the clearances. Mason Cox played as 1struck on the ball in the 2ndhalf of the ¼ and has done a good job. The 1stfew minutes the game is marred by 2 or 3 shocking umpiring decisions, which, fortunately don’t affect the score much. Pretty dour game and it’s 1.4 to 2.8. 23min mark and it’s 1.5 to 3.7 the Cats. Just not working properly at the moment, a low-key, messy game with no-one getting on top. God junior kicks a nice goal – the Cats are seemingly a tad cleaner out of the centre. 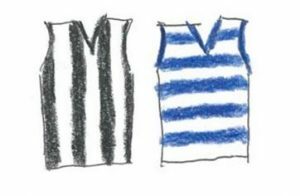 ½ time at 26mins and 17secs and it’s 1.6 Collingwood and Geelong, 4.7. one goal for the half… A real arm wrestle and The Pies not out of it at this stage really. Difference is that the Cats are winning the clearances generally although our pressure around the ground is keeping us in it. It just seems that we can’t find any rhythm at all unlike the previous 3 or 4 weeks and getting lost on the backline a lot. Dunno whether it’s the team changes – certainly we miss our captain – but Geelong are certainly cleaner at the ball. 5mins in and Tom Phillips gets the 1stgoal of the 2ndhalf and we are looking considerably cleaner. Phillips goes off (and doesn’t return). De Goey marks and it’s 3.7 to 4.8 and it’s looking better with a lot more rhythm and purpose. Ablett and Dangerfield both playing well and 2 goals in succession to Menegola. 23min mark and we get another by WHE. Then follows another 4 behinds (one rushed) and having all the play in the last 10mins we are kicking ourselves out of it. ¾ time and it’s 4.11 to 7.10 and we have outscored them for the 1sttime today, 3.5 to 3.3. Grundy gets the last and it’s all over red rover, 5.15 to 9.12. 21 points is not a thrashing. 20 shots to 22 is a pretty even affair. Scoreboard pressure is what it is all about and we simply could not apply it. Sure we lost 2 players out of the rotations, However we were still good enough with 20 to 22. Scoreboard pressure didn’t happen is this game because our forward line couldn’t get its act together against a good Cats line-up. The midfield without Captain Silky and Phillips for half the game couldn’t take up the slack. Thank heavens for our defence. There were a few good but unexpected contributors on the day. Chris Mayne played his best game for the Pies. He has nominally replaced James Aish and on this performance will hold his spot. Mason Cox held some good marks and he provided a presence. It’s obvious that opposing teams rate him and he’ll get plenty more free kicks in marking contents. Needs to work on what he does after he marks it. Appleby showed enough to get more games even when those on our long list of wounded get themselves right. Wells will be better for the game. Shame he missed 2 goals that would have provided some of the aforementioned scoreboard pressure. So to the Horsburgh votes. The Brownlow has become a midfielders medal and our own Horsburgh has been won by on ballers in my time in the FPS. Yes, on ballers do the majority of the work of ball travel and by definition they get a lot of the ball. In our team they need to score as well but this week they didn’t. In contrast a defenders main job is to limit opposition scores. Therefore in this low scoring game we should reward our designated defenders and not those who managed just 5 goals 15 behinds for a 21 point loss. 3 votes: Jeremy Howe. He was often directly opposed to Dangerfield and beat him a number of times one on one. He took his usual quota of marks and just missed a goal from a Mason Cox hand off. Thank you MFC for giving us JH and the oft criticised Linden Dunn. These blokes get the opposition’s best forwards each week and they are seldom beaten. 2 votes: Jack Crisp. This guy is also seldom beaten. Shame that he doesn’t have a right foot but he is quick and brave. I elevated him to 2 votes because of his great run down of some Geelong bloke. Thank you Brisbane for trading him. 1 vote: Matthew Scharenberg. One of his best games – best I’ve seen in person. He shows poise under pressure and is quick enough to play on the smaller forwards and brave enough to get in the way of the big forwards. He’s a better all-round player than Tom Langdon and definitely a better kick. Hey Doug, I was going to attend this game on my MCC membership, though Mother’s Day got in the way. As a neutral observer I probably dodged a bullet. It looked like an ordinary game from what I saw on tv. That’s a shame as both teams had looked good in previous games. Looks like your injury list may get in the way again of you having a good crack at it. See ya! As a Cats fan sitting in what seemed to be a nest of Magpies, I was most amused to hear their vilification of Chris Mayne. Seemed to be held in the same esteem in the Pies fold as Rhys Stanley with Cats fans. Interested that you rate this as his best game for the Pies. Vilification as you put it Belly,or bagging your own players is one of the most unpleasant aspects of footy barracking. Sure Mayne and Stanley are on big money but who knows what the fine print of players’ contracts say. Maybe the reputed high amounts are paid only for seniors appearances ie performance based? All players are trying to do their best, hit a target, lower their eyes, lift their eyes, mind their man, find space, honour the lead etc etc etc. Players (everyone) reacts more positively to encouraging or constructive comments. Yes, that’s hard to do in a 4 word shout out when a counselling session would be more appropriate. Unfortunately much easier to yell “garrr your hopeless Mayne”. Footy barracking offers so much to spectators as a relief valve to everyday life. Sometimes you get a glimpse or an earful of the inner thoughts and frustrations of those around you. Perhaps a reflection on the inequities of a tax system that favours the haves or footy contracts that are offered to average achievers compared to the honest workhorses like Goldy. PS it’s embarrassing listening to booing of Gary Ablett when everyone enjoys watching him play. Just a pity that our version in Pendlebury wasn’t able to similarly wrong foot his pursuers on the day. Yep, it’s not a good look, Doug. Although one hopes it’s as you posit, a surrogate means of venting wider frustrations, I suspect the antipathy to certain players isn’t simply restricted to the field of play. Btw, agree re Ratagolea. He’s going to be a gun. Reckon he was the best player of Fijian heritage going around last week.